Are you planning an incredible African safari? Be sure to capture every element of this extraordinary experience by downloading the ultimate African safari app prior to traveling to Africa. Track My Safari is your perfect digital journal tool for African safari game drives. With a simple click of a button, you can easily record your route map, photos, game sightings, and more. This is the best way to stay digitally organized on your African safari adventures. There are several apps and countless books that will help to identify the African animals that you will encounter on your game drives. Nothing can compare to Track My Safari which will document your game drives and enable you to relive the adventures whenever you want to. If you are interested in other African apps we have used, you can read our piece here. Why use Track My Safari? Have you ever forgotten where you took a photo? Where was the pride of lions with those adorable baby lion cubs? They seemed so close to the lodge… Do you wish you could see exactly where you’d ventured on all your game drives? Have you ever spent too much time uploading your social media content? Then found you’re spending too little time enjoying your surroundings? The Track My Safari African game drive app can help with all these dilemmas. This African safari iPhone and Android app is simple to use. It keeps track of all your game drives using GPS rather than data cell service. Never forget a moment of your African safari when you’re using Track My Safari. If you want to focus on soaking in the safari experience while still maintaining your social media presence, and sharing your adventures with friends and family, you’ll definitely want to use this African safari app. It truly helps you capture every aspect of every game drive. There are several unique features on the Track My Safari app that will help you stay organized on your African safari adventure. Each feature is designed to work seamlessly with your trip through the African bush. With Track My Safari you can track your game drives, take photos, and document memories with the click of a button. If you have questions about how the app works, you can read through our FAQ page here. Each unique game drive will be saved as a separate trip within the app, so you’ll create a new route map for each safari excursion. If you go out for a game drive in the morning – create a trip for that event. Create a separate one in the afternoon if you go out again. This way you will be able to zoom in and see all the details clearly. Even better, since the app works using GPS, you don’t need to have cell service available to use the app which is ideal when you’re a long way from home. Of course, a GPS map is nothing new. However, the app has several awesome interactive features that you can use to give meaning to the maps of your game drives. Within Track My Safari, you can mark where you took each photo. When you take a photo, the app will drop a photo pin at the exact point where the photo was taken. The app stores your photos both within the app and by default it is also stored in your phone’s photo gallery. You’ll have easy access to your images no matter what you want to do. Snap photos of the hordes of wildebeest, the grazing elephants, giraffes snacking on the thorny acacias and cape buffalo. All your photos will be waiting for you at the end of your safari game drive and you’ll be able to relish in the memories when you re-visit your past game drives whether it’s that evening when you’re back at camp or 2 months later. 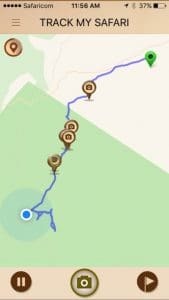 Track My Safari includes unique pins for other points of interest which you can also use to add even more details to your African game drives. Did you spot a lion or an elephant? Drop a “Big 5” marker on the spot to help you remember where you saw the most memorable African game. (Was your path blocked by a thundering herd of wildebeest? Mark it as a “Migration Crossing.” Each time you stop for a meal, you can drop a meal marker. When the end of the day is upon you and the fire has been lit, you can pin the precise location with a “Campfire” waypoint. There’s also a waypoint for “Village Visits,” which you can use to show the communities you visit along the way. Capture the location of each exciting aspect of your African Safari. Once you’re back at camp and connected to Wi-Fi, you can finish your trip, review your photos and share your game drive to social media. 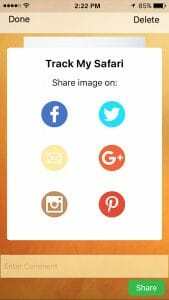 The app allows you to make comments on your photos and choose which social media channels to use. If sharing to Facebook, the entire experience is shared ie the map and all your photos. Other social media channels like Twitter, Instagram, Google+ and Pinterest will upload your map with photo pins and waypoints by default. You can also send the entire trip via email. You have the option to use the check in feature in Track My Safari to check in on Facebook and your friends will know that you’re enjoying one of life’s greatest experiences. Sharing your adventures with your friends and family is quick and easy, and you will still have plenty of time to sip something cool as the red, round sun sets in the dusty sky. Sadly it is a concern to all who love Africa and her wildlife that poachers have such a negative impact on the animal populations. Track My Safari does not identify individual animal breeds within the selection of waypoints – it just has the more general “Big 5”. This was done to minimize the possibility of giving poachers specific information about the location of the animals that are under attack. Naturally, since the app was designed for use in the African bush, it works perfectly in this setting. You can begin each trip on Wi-Fi, you can use it even in the most remote of African safari destinations. If you have wi-fi to start and finish each trip, you’re all set. Since you have invested in a once-in-a-lifetime African safari trip, make sure every detail of your amazing trip is documented forever. Use Track My Safari to make every moment of your incredible safari into a memory that lasts a lifetime. Track My Safari App is an African safari app for iPhones, cellular enabled iPads and Android devices. Applicable for Android phones and tablets since they all have GPS. Before leaving home, search for the app in your phone’s app store, and you can quickly download it for just US$4.99. The price on your App Store will be in your local currency but it will be the equivalent to US$4.99. Download the app onto your device. Sign up for an account to get started, and you can log in with your account details or Facebook – whichever you prefer. After just a few moments, you’ll be ready to go! When you experience an African safari, you’ll be sure to create incredible memories. Document those memories so that you can revisit and relish your game drives, and the whole African safari experience whenever you feel the urge. Using Track My Safari, you’ll be able to quickly and easily record each incredible aspect of your journey.